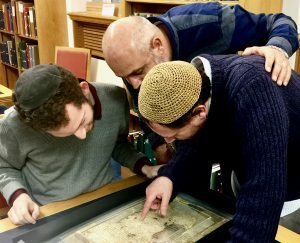 During their visit in November 2017, some of our founder members travelled to Cambridge to meet with Abrahamic Reunion Peacemaker Rabbi Mordechai Zeller, who is currently the Jewish Chaplain at Cambridge University. 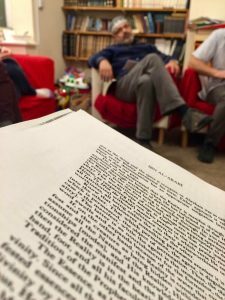 It is interfaith week in England, and Mordechai has invited the Abrahamic Reunion, and the Cambridge University Islamic Society (Isoc) to his weekly Zohar study group. The word Zohar means “splendour” or “radiance” and it is considered to be the core text of Jewish mystical thought known as Kabbalah, which offers a mystical interpretation of the Bible. Hidden for 900 years between the 2nd and 11th centuries, the Zohar began to be shared in the 16thcentury when The Holy Ari, Rabbi Isaac Luria (1534-1572) stated that from his time onward, the wisdom of Kabbalah was ready to be opened to everyone. A “Bezel” is a setting on a ring, and in Arab culture this “Bezal” would have been set with a gem, engraved with the wearer’s name, to make the ring into a seal. 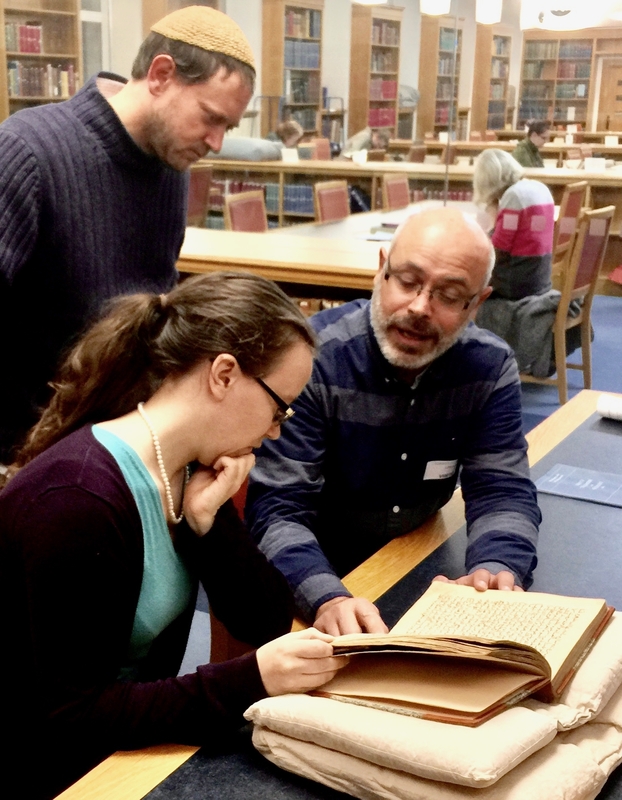 We are escorted through a series of locked doors that require pass codes, to a room containing Cambridge University’s most valuable and precious books. Photos are forbidden as two ancient volumes are offered to us on pillows. 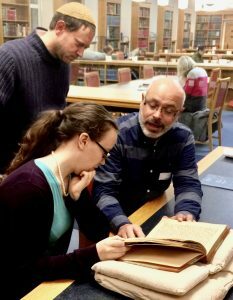 Only one person, Estara, the research specialist has permission to touch the books, and turn the pages, which have been mounted on special paper to preserve them. One book was composed in the 14th century, and the other one was written in the 16th century. Several different scribes hand wrote each volume, as Estara points out where the script of each different scribe changes. We hover around Estara, as she turns the pages, and Ghassan begins to read out loud when he comes to the section on Abraham. Certain pages contain blank symbols in the midst of the hand written script. Ghassan explains these esoteric symbols are ciphers and amulets used to transmit realization and messages to the reader. 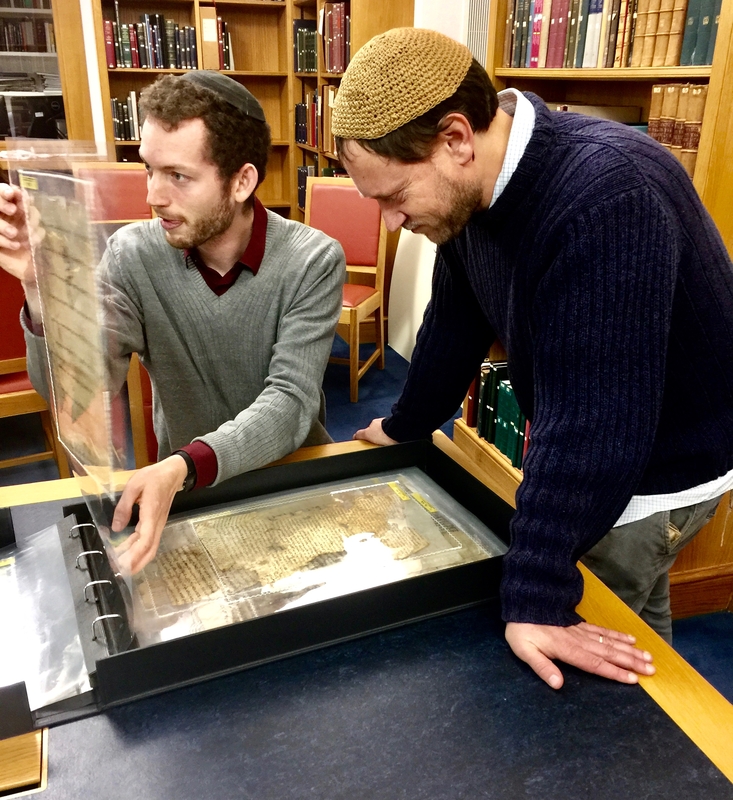 The margins of the pages contain hand written notes in Arabic, Hebrew, and other ancient languages, the work of long ago scholars deciphering the esoteric contents for their own research. As we gather for our meeting about 25 people enter the room. As they introduce themselves I am quick to realise that this text study group is not going to be like any text study group I have attended before. This will be a meeting of biblical scholars. Although many are still students most are postgraduates doing advanced biblical study. I am stunned by the similarities and I wonder what is the connection between these two authors? What journeys have transpired, and what exchange of knowledge has taken place to inform these two great works? Surely the influences must be there. The similarities are obvious to everyone, and the scholars offer informed speculations, that may have transpired, and identify scholarly connections within and between these two spiritual lineages. I feel grateful that the enlightened spiritual leaders in the Abrahamic Reunion such as Sheikh Ghassan Mansara and Rabbi Mordechai Zeller, are able to guide participants in these text study programs to break through the academic shell that can imprison the spiritual experience that the authors intended their readers to have.